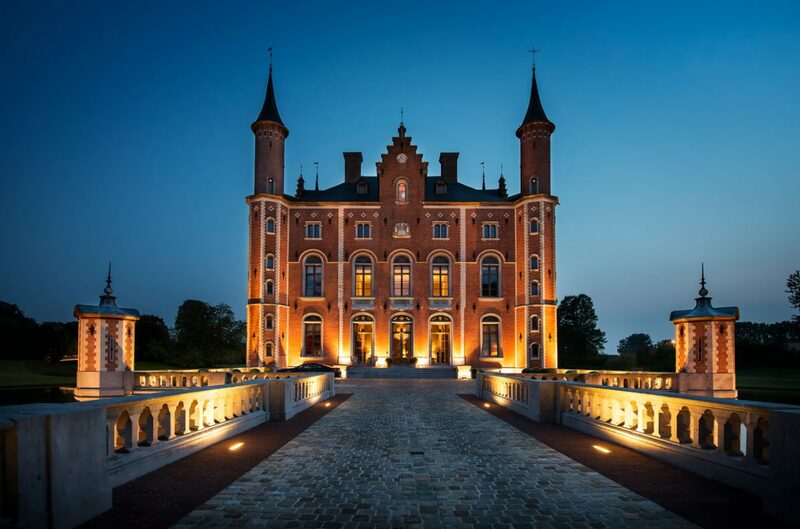 The four corner turrets of the Belgian Castle Olsene reach up into the sky with a svelte and regal elegance. Reflected in the waters surrounding it, in sprawling parkland grounds with grand old trees, it doesn’t get any more enchanting than this moated dream of a home. 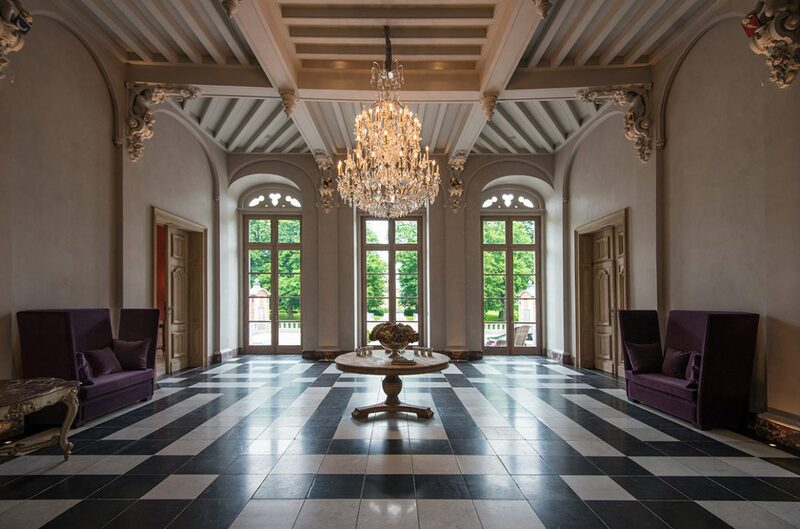 Located between Ghent and Kortijk, the castle was built in the 19th century on ancient castle walls. Hardly anything captures the imagination quite like an old building. Or even better: a castle. They are places for heading off on journeys into the past, exploring ancient halls, chambers, attics and cellars, possibly even stumbling across undiscovered treasures, and reigniting childhood dreams. Belgium is rich in castles, stately homes and splendid old buildings with gorgeous gardens and sprawling parks, all set amidst the most charming of scenery. Among the real gems here are, of course, moated castles, which always look just that little bit more stunning than their cousins on land. 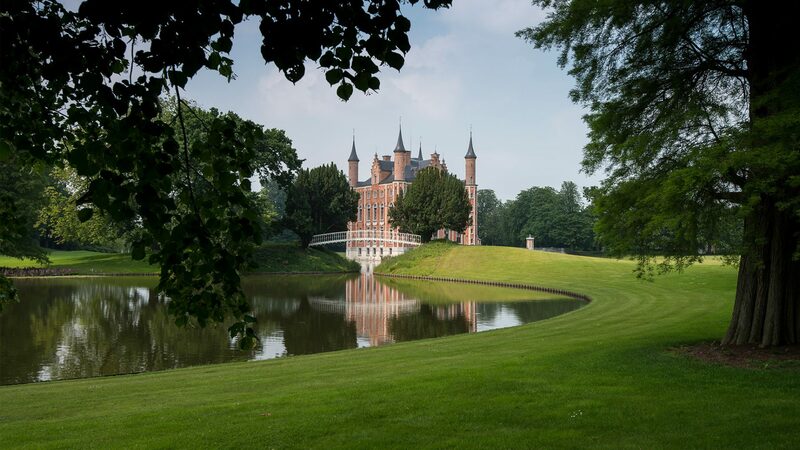 A particularly stunning example is Castle Olsene on the ‘Grote Steenweg’ (Great Stone Path) in Zulte, a municipality in the Belgian province of East Flanders between Ghent and Kortrijk. The Lords of Olsene ruled here since as far back as the end of the 11th century, residing in the castle known as ‘Hof Ter Wallen’. Then in 1732, the Piers de Ravenschoot dynasty took over ownership of the estate. In the mid 19th century, the custodians at the time decided to tear the castle down and build a new moated castle on its foundations. The famous Ghent architect Louis Minard (1801 – 1875) was awarded the commission for this epic undertaking. He had previously made a name for himself with the design of numerous churches and his works had an impact on the architectural style of the newly founded Belgian state. Castle Olsene is a typical example of historicism and the Neo-Gothic architectural style so popular at the time, as well as the Neo-Renaissance – in this specific case based on the Flemish Renaissance style. The return to architectural principles during this period sees a predominance of harmonious proportions once again. Ornamental forms like archways based on geometric forms like the rectangle and circle can be found in abundance, together with cornices that serve as horizontal dividing elements. Pillars and pilasters are in the Classical colonnade style. And so it came to pass that Louis Minard erected the new historicist-style structure on the foundations of the demolishedcastle. The bright brick building with its subtle white decorative features and four stepped gables has four almost identically designed façades. Four hexagonal towers mark the corners, rising to form small round turrets at the top crowned with black spires. It is this special architectural feature in particular – along with its water setting – that really gives the castle its fairytale charm. The driveway leading up to the castle is impressive in itself: two pavilions mark the entrance to the 850-metre long avenue – lined with beautiful maple trees, beeches, sycamores and European and American oaks – ending right at the castle walls. Above all in autumn, when the leaves of the various deciduous trees burst into a bright array of yellows, reds and browns, the scene is quite simply overwhelming. An impressive bridge with three archways then leads across the moat to the inner courtyard of the castle. The ensemble has been listed for its historic significance – along with the entire private estate – since 1995. Obvious questions are bound to spring to mind here: How is it possible make a castle a genuinely cosy home? How can a sense of homeliness be brought about in its lofty halls and vast rooms? What furnishings and which colours are suitable when it comes to decorating a house that is more than 150 years old? What gives the antique tiled floors warmth? 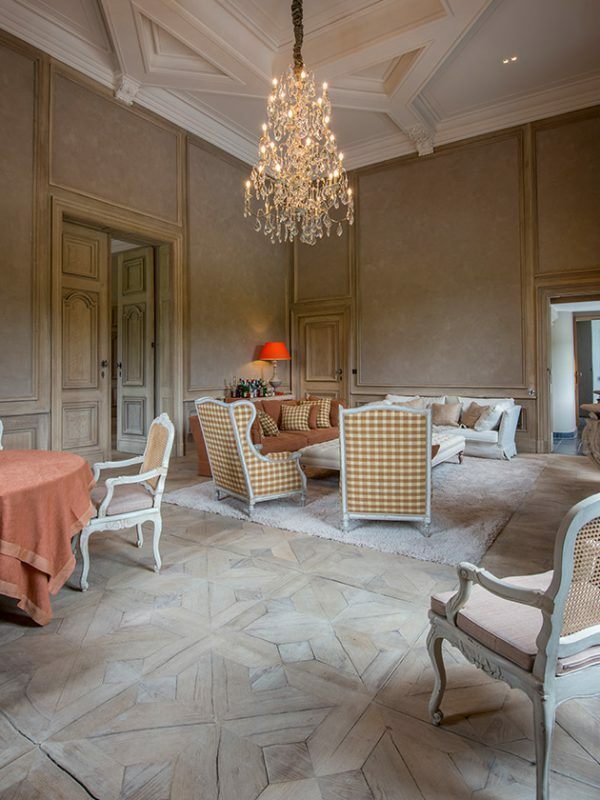 Is it possible at all to lead a contemporary lifestyle in a building dating from the 19th century where the ceilings are frequently very high and period features like the stuccowork, wooden ceiling beams and herringbone parquet have all been preserved? The answer is an unequivocal yes! In Castle Olsene, residents need not forego any of the conveniences and comfort that the 21st century has to offer. 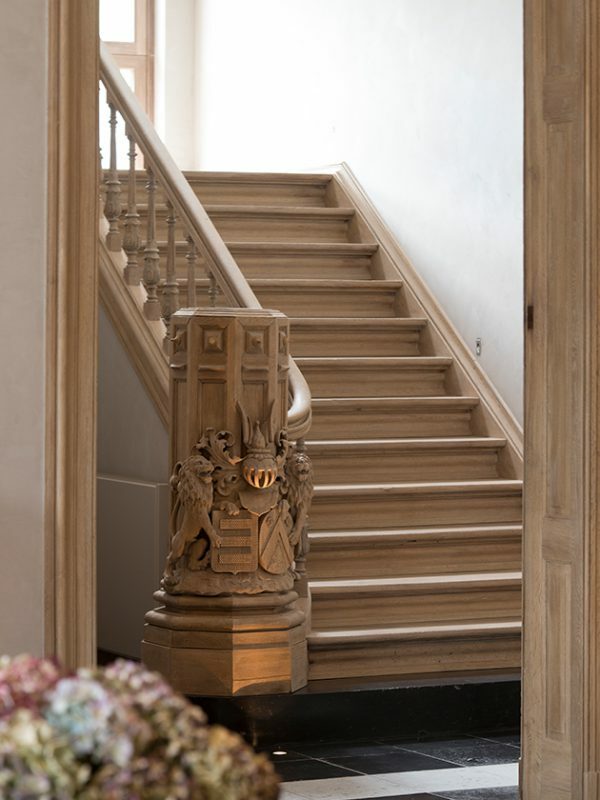 The interior of this elegant residence spans more than 2,000 m2 in total, with an incredible 73 rooms in all – each restored with a great sensibility and finesse, as well as respect for the history behind this castle. 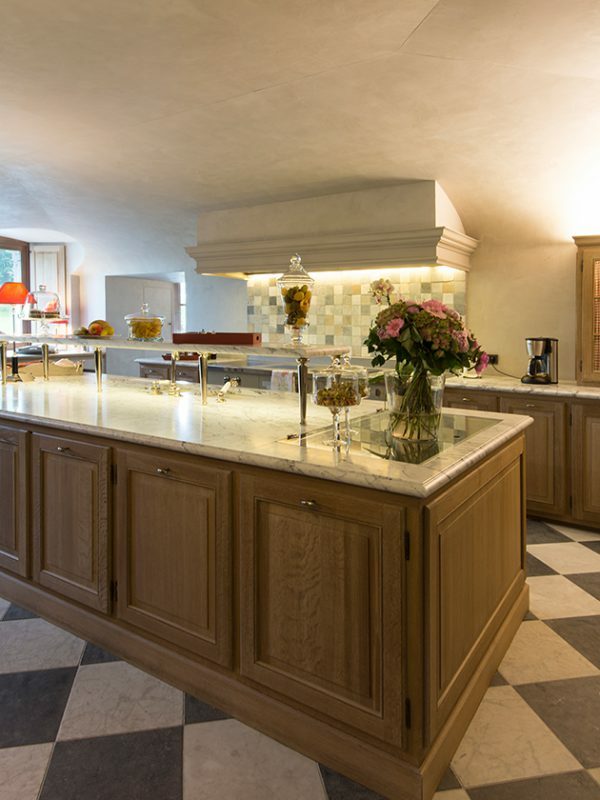 There are various living and receptions rooms, dining rooms and libraries, three fully fitted kitchens, five comfortable bedrooms each featuring en suite dressing rooms and bathrooms, in addition to a billiard room and a private cinema. 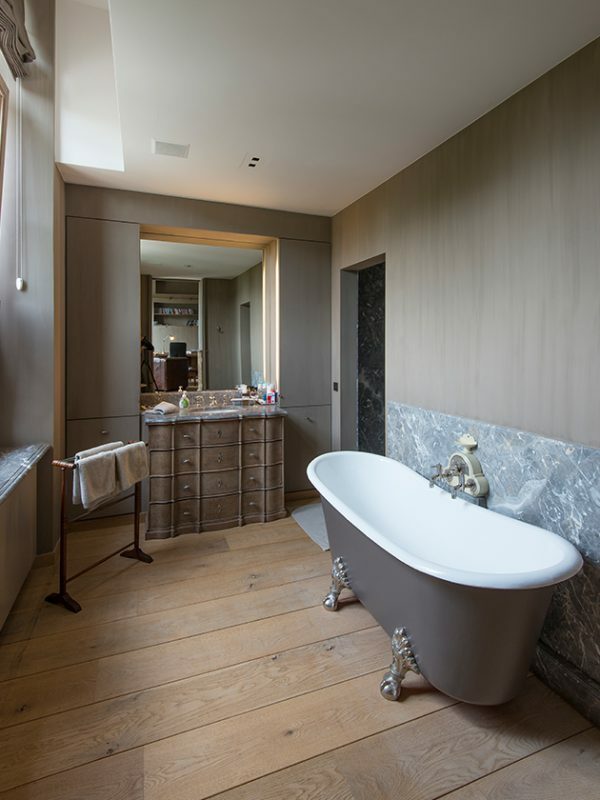 There is also a luxurious home spa complete with an indoor swimming pool, sauna and Jacuzzi, in addition to a laundry, an underground garage with space for up to twelve cars, a car wash, and a wine cellar. Three elevators make it remarkably easy to move between the various floors of the castle. Set within the context of this moated castle with its fascinating history, the outdoor pool within the old castle walls adds a contemporary touch and a whimsical wink to the present. Underneath a hill in the garden there is still even an old ice cellar where all the residents of Olsene used to keep their meat cool in the past. People even came from the hospital in Deinze twelve kilometres away to fetch ice blocks aimed at helping to alleviate patients’ pain. Castle Olsene is a prime example of a residence rich in heritage where there has been absolutely no attempt to debunk or whitewash the remnants of the past. A palette predominantly made up of soft colour tones and warm materials exudes a calm sleekness, set against contemporary furniture that blends in harmoniously with the whole. The greatest luxury of all though in this moated castle must surely be the sensational views from all rooms: overlooking the wonderful park grounds and the lake as its banks meander their way around the green environs. This retreat really could not be more perfect.